don't you love the looks on kids' faces when they play in water? just pure delight! 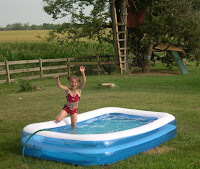 we inflated the pool today and filled it with freezing water, but the kids had to play anyway! they were indeed freezing, but they had a blast. 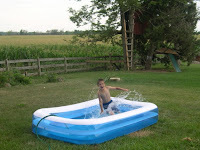 of course when you're too big for a kiddie pool, you have to be creative to make it fun, and they sure did. pics and video below!